THE BORINQUENEERS won the Best Documentary award at the 9th Annual Real to Reel International Film Festival in Shelby, NC which took place from July 23-26, 2008. Congratulations to Naomi Figueroa Soulet (Producer/Director), Raquel Ortiz (Co-Director) Hector Elizondo (Narrator), Miguel Picker (Editor) and the rest of the team members for a job well done. Hundreds of mourners trekked up a flag-lined street Saturday for the funeral of Army Staff Sgt. Alex Jimenez, whose body was found 14 months after he and two fellow soldiers were captured during an ambush in Iraq. The coffin arrived covered by an American flag and atop a horse-drawn carriage, escorted by fellow members of the Fort Drum, New York-based 10th Mountain Division. Jimenez will be buried Aug. 2 at Long Island National Cemetery. He was born in New York and his mother, Maria Duran, lives in Corona, Queens. Related: Sgt. Alex Jiménez (POW/MIA): R.I.P. In addition to their strong support for Obama, Pew found that Latino voters have moved sharply into the Democratic camp in the past two years, reversing a pro-GOP tide that had been evident among Latinos earlier in the decade. Some 65% of Latino registered voters now say they identify with or lean toward the Democratic Party, compared with just 26% who identify with or lean toward the GOP. Why? The rampant anti-Latino nativism of the GOP since 2001 is a big reason. However, the free-flowing hostility towards the country's most dynamic and fast-growing ethnic group is symptomatic of the failed presidency of George W. Bush and the party he leads. Latinos--as do decent Americans everywhere--insist upon enlightened, effective and accountable national leaders. The poll surveyed 2,015 Latino registered voters from June 9 through July 13, 2008. Interviews were conducted in English and Spanish. Dr. Alfredo Quinones-Hinojosa talks to Big Think about his incredible, and improbable, journey from his birth in Baja, Mexico, to his time as a migrant worker to his work today as a neurosurgeon and neuroscientist at Johns Hopkins Bayview Hospital in Baltimore, Maryland. But in the darkest hours, the people of Berlin kept the flame of hope burning. The people of Berlin refused to give up. And on one fall day, hundreds of thousands of Berliners came here, to the Tiergarten, and heard the city’s mayor implore the world not to give up on freedom. "There is only one possibility," he said. "For us to stand together united until this battle is won...The people of Berlin have spoken. We have done our duty, and we will keep on doing our duty. People of the world: now do your duty...People of the world, look at Berlin!" 3,000 migrants dead: Does anyone care? Shawn Kiehne is a 32 year old Southwesterner of German heritage who calls himself El Gringo. Fluent in Spanish from his days working with Mexican Vaqueros on his uncle's ranch near El Paso, Kiehne has transformed himself into an emerging star in the Regional Mexican musical genre. Talk about a reverse crossover dream! To my illegal friends who live in the U.S. This country needs your effort and your work. With 35 million persons of Mexican heritage in the U.S., 1million U.S. nationals living in and loving Mexico, millions more Americans fascinated by all things Mexican, add in the growing number of U.S. children of partial Mexican heritage, and Kiehne's embrace may help spur the emergence of a pro-Mexican sentiment among younger Americans. That's my assessment midway through Senator Barack Obama's trip to the Middle East and Europe. The idea of interviewing for the job of U.S. Commander-in-Chief by traveling abroad, visiting with war zone and European allies, accompanied by MSM, is hugely bold and risky. Too risky most U.S. politicians, but not for the audacious Barack Obama -- and it's paying off. Middle Eastern and European leaders are lining up to meet and be seen with Obama -- the likely next leader of the world's most powerful nation. The pictures being broadcast back home are awesome. And Senator Obama grows in stature with every new foreign dignitary he meets. 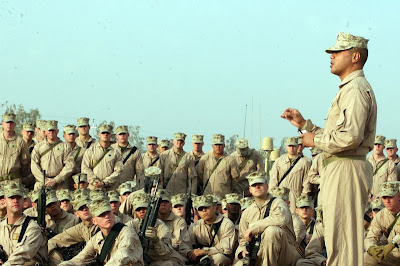 1) The soldiers in Kuwait were absolutely giddy to have Obama visit and give them his vow of support. To cap it off, Obama's 3 pointer sent the auditorium of hard boiled military heroes into levels of excitement typically reserved for idol worshipping teenie boppers. 2) The video of Obama's swish immediately went viral and the netroots across the blogosphere nearly fainted in delight. 3) Next came Obama's visit with Afghanistan's beleaguered President Karzai. Not only did Obama look imminently credible as a potential U.S. President, but more importantly, the Afghanistan leaders looked genuinely relieved to have an American leader make the sorts of commitments the Bush Regime should have been made from the start. After all, it was the Taliban that harbored and aided the terrorists of 9/11; and it's the Taliban and Al Qaeda that are killing U.S. soldiers and weakening the Afghan government. Duh!!! 4) Most surprisingly, Obama's position of refocusing the 'War on Terror' on the Afghanistan theatre received unexpected support back home from two newly minted converts: George W. Bush and John McCain. 5) Yesterday, Obama met with Prime Minister Nouri al-Maliki and other Iraqi leaders, and walked-away with not-so-subtle endorsements of his plan to phase down U.S. combat troops. 7) Today, Obama held an outdoor press conference in Jordan where he took questions about his trip from America's news heavy weights. A relaxed Obama was in command and looked presidential. Later, Obama meets with Jordan's King Abdullah for talks and photos. 8) Tomorrow, Obama travels to Israel where he'll reassure Israeli leaders and citizens of his support for the Jewish state and for a peaceful and equitable solution to the Israeli-Palestinian problem. 9) Obama then travels to Germany for a major foreign policy speech in Berlin's Tiergarten; followed by visits with France's Nicolas Sarkozy at the Elysee Palace, Friday, and UK's Gordon Brown at Downing Street, Saturday. 10) Obama then returns home triumphantly and with enhanced stature--at least that's what the Obama folks hope. The Obama camp's brilliance is contrasted by McCain camp's silliness. Upset that Obama is getting lots of attention on his swing foreign policy tour, a grumpy McCain campaign is bitterly complaining that the media is biased for Obama. Apparently, the McCain people have forgotten Ronald Reagan's first PR rule: Give reporters something to write about--and/or, give them great pictures. Q: Exactly what is McCain offering the press--and news readers/viewers? For example, McCain travelled to New Hampshire for a town hall meeting--something he's done there over 100 times. Not exactly newsworthy. That's probably why there was only one reporter for the McCain party's arrival in Manchester. This we know. 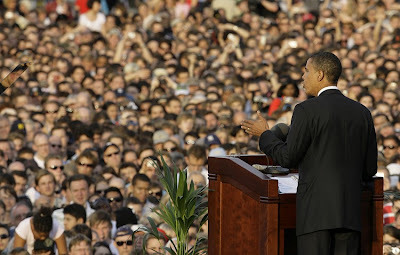 Reporters, by the hundreds and even the thousands, serve as Obama’s fan club and honor guard. They are his roadies, his groupies. But at least Obama gives them a story. McCain has no story and if he does, he’s already given it and there’s nothing more to say – nothing fresh, for sure. That unnecessary smile and those two thumbs up don’t do the trick. The McCain camp is so desperate for attention that allied conservative, columnist Robert Novak, is aiding the campaign by "divulging" that a VP may named as early as this weekend. However, don't expect to see an actual announcement anytime soon because doing so gives away McCain's only newsworthy story too soon. What else will he have to dangle before the media? What's apparent in this unique week of presidential politicing is that Obama has a campaign plan that he's methodically following--and McCain doesn't. Without his own plan, McCain's is left simply reacting to what Obama--and Obama surrogates, family members, friends, aquaintances, former ministers, neighbors, etc.--say and do. It's an honor whenever readers--especially fellow bloggers--think enough of what you do to recommend it to others. The publisher of my oh my oh my oh has done just that in Pensamientos con los blogueros -- a search for the best online Latino oriented election coverage. She/he picked the best of the Latino Netroots in these three categories: Individual Bloggers; Intentional/Professional Blogs: and Spanish Language websites. American Taíno - The most credible and authentic independent Latino blog I found, author identified himself and covers a variety of topics with an open and independent mind. Tu voto es tu futuro - The Spanish Language news service of AOL. Good continuous balanced coverage of both candidates – sort of looks foreign after looking at so many one sided blogs and web sites. One of the two Latino or Spanish language pieces on McCain’s address to the National Council of La Raza that I found (the other was at American Taino) and the only place where I saw strong anti-Obama comments posted from users. For more than thirty years, exit polls accurately predicted election results. Over the last ten years that reliability has disappeared. The last two presidential elections both came down to a relatively small number of votes, and in both elections the integrity of the voting process has been called into question. With the upcoming election looking to be similarly close, the time has come to ask the questions: What happened in 2000 and 2004? What, if anything, has changed since? And what can be done to ensure a fair and honest tabulation of votes in 2008? This film brings together behind-the-scenes perspectives from the U.S presidential election of 2004 – plus startling stories from key races in 1998, 2000, 2002 and 2006. The film sheds light on a decade of vote counts that don’t match votes cast – uncounted ballots, vote switching, under-votes, an many other examples of election totals that warrant serious investigation. This film unveils patterns of anomalies at every level of the electoral process. Controversial partnerships perpetuate a secretive environment, as relevant facts and figures remain hidden from view. As a result, most Americans have no real sense of the threat to fair elections. 555 - 11th Street, NW, Washington, D.C.
Ramiro Carrillo Rodriguez, 48, father of two, died in Selma, California after working all day for Sun Valley Packing in Reedley through a farm labor contractor. Ramiro had complained being sick from the heat. Ramiro's death makes two farm workers dying of heatstroke last week, four farm worker heat deaths in the last 8 weeks. Link: Ramiro Carrillo Rodriguez was the fourth farm worker in the last two weeks to die of heat stroke. Sgt. Alex Jiménez (POW/MIA): R.I.P. Remember Army Sgt. 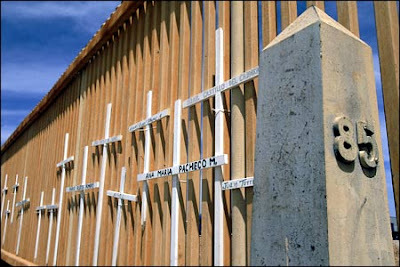 Alex Jiménez, the soldier of Dominican birth missing in action (MIA) when he and two others were ambushed in May of 2007 in an area south of Baghdad known as the "triangle of death"? Unfortunately, for his loved ones--including his young wife Yaderlin, he's dead. His remains were recently recovered. When I heard about Sgt. Alex Jiménez' story last year, it was beyond disturbing. At the very moment that the heroic Sgt. Jiménez went missing in action in service to the U.S.A., his young wife, Yaderlin, was being threatened with deportation. Of the many shameful acts committed against Latino immigrants in the last few years, attempting to deport the wife of a service man missing in action has to be among the worse. Only after a public outcry, and the powerful advocacy of Senator John Kerry, did the federal authorities back-off. Yaderlin was subsequently awarded permanent residency a year ago July '07. A year later, Yaderlin Hiraldo Jiménez' name has been added to the growing list of prematurely widowed Latina immigrants. Lt. Col. Max A. Galea'i of the 2d Battalion, Marine Corps-Hawaii, was one of three Marines killed June 26th in a suicide bomb attack in Anbar Province, Iraq. Some 20 Iraqis also died in the bombing. A native of Pago Pago, American Samoa, Lt. Col. Galea'i is survived by his wife, Evelyn Ho Ching Galea’i, and their four children. "It reminds us of the sacrifices being made everyday. It's a very sad day for us as a family." Simon Sanchez, Cousin. The death of Lt. Col. Galea’i brings the total number of Samoan soldiers killed in the Iraq/Afghanistan wars since 2003 to 17: 14 in Iraq and 3 in Afghanistan. Lt. Col. Galea’i's service awards include two Bronze Stars, the Purple Heart and five Meritorious Service Medals. Is McCain trying to lose the Latino vote? If he isn't -- and he really, honestly wants at least a W '00 size Latino vote this fall, he has a funny way of showing it. Consider that McCain was for fixing the U.S. immigration system when he needed Latino votes in his U.S. Senate contests in Arizona--a cause he promptly abandoned this year in his quest for the nomination of a nativist GOP. McCain then spends three days cozying up to the leaders of Latin America's most rightwing regimes: Colombia's Álvaro Uribe and Mexico's Felipe Calderón. BTW: The continuation of U.S. support for these repressive, anti-democratic and anti-worker regimes simply guarantees a continuing wave of economic and political refugees to the U.S., Canada and elsewhere. And last week, at the League of United Latin American Citizens Conference, McCain adds insult to injury by ignoring the devastation wrought by the attacks on Latino immigrants from his party and its rightwing media propagandists. Instead, McCain offers the assembled audience of mostly community advocates, educators and local officials a repackaging of W's proven anti-worker tax schemes. In stark contrast, Barack Obama has consistently advocated for immigration reform and other issues of importance to Latinos. 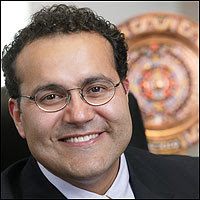 Additionally, his recent speeches at NALEO (here) and LULAC (below) evidence respect for Latinos and genuine solidarity. Army Sgt 1st Class Jeffrey Rada Morales: R.I.P.